Travelling abroad alone? Brilliant – you’ll have a wonderful time with nobody else to please! But take our advice, and think like a savvy traveller. Our safety tips will help you to be prepared for your adventures, and avoid risks along the way. Wherever you travel, a confident attitude will keep you out of the mugger’s sights. Even if you’re lost, don’t show it. Act as though you’re a local, who knows precisely where they’re headed. Hold your head high and walk purposefully (in the direction you think might be the right one!). If you need to stop to check your map or ask directions, choose a quiet spot where you won’t be noticed. Or even better, stop in a reputable store or tourist bureau and get directions in person. What does a local look like? Plain clothes, shopping bags, and no camera straps. For women, this means checking the cultural etiquette before travelling. Avoid typical ‘tourist’ gear that will mark you out to potential predators – Hawaiian shorts, a big map and expensive camera strung around your neck are not advisable! 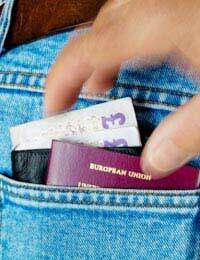 Leave your passport and travel documents in the hotel, if a safe is available. To carry your cash and cards, it’s worth picking up a money belt. These are usually available in airports. They’re like slender bum-bags that can be worn beneath your clothing. If you’re wearing one, guard against theft by also carrying some loose change and notes in your pocket. If you’re stopped by a thief or mugger, they’re unlikely to believe that you are carrying no cash. Handing over some change could save you from losing cards and notes. A high-risk situation is anywhere that you’re withdrawing or handling cash. But it can also be created by a team of pickpockets or others. If there’s a disturbance or a crowded scene, be aware that it could be a staged diversion – even women and children are used as pawns. When crowds gather to watch snake charmers in Marrakesh, sly thieves patrol the perimeter, helping themselves to back-pocket wallets. Vigilance will help you to stay safe. Before you go, or even when you’re there, it only takes ten minutes to get online and do some quick research about the local scams. Beware of people who approach you with a seemingly innocent motive – even ‘lost’ travellers could be distracting your attention from their pal’s hands in your bag. On the bus or train, you could be busy trying to move further from the wandering-hands, while crime no2 is happening behind you, as your wallet’s removed from your back pocket. In Rome, for example, the women dressed as beggars could have trained pickpockets hidden under their skirts – or they could be providing a diversion by calling to you while someone else picks your pockets. Another common technique is for a stranger to approach you to ‘wipe off’ the ‘grease’ or ‘bird droppings’ on your jacket. Suspicious? You should be. A pickpocket will always find excuses to touch you: when you’re desensitised to it, they’re better able to whip off your jewellery or watch.